This gives a 400 x 400 matrix of distances from 0-2. I then made the list of edges (the distances) and vertices (each of the 400 individuals) using the below method from http://kateto.net/networks-r-igraph (section 3.1). indicating that all individuals were sorted into the same community. 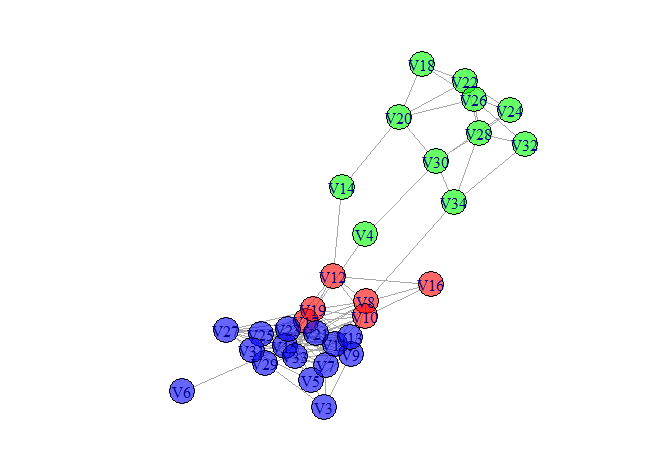 The clustering also ran immediately (i.e. with almost no computation time), which also makes me think it was not working correctly. My question is: Can anyone suggest why the cluster_louvain method did not work and identified just one community? I think I must be specifying the distance matrix or edges/nodes incorrectly, or in some other way not giving the correct input to the cluster_louvain method. I am relatively new to R so would be very grateful for any advice. I have successfully used other methods of community detection on the same distance matrix (i.e. k-means) which identified 2-3 communities, but would like to understand what I have done wrong here. 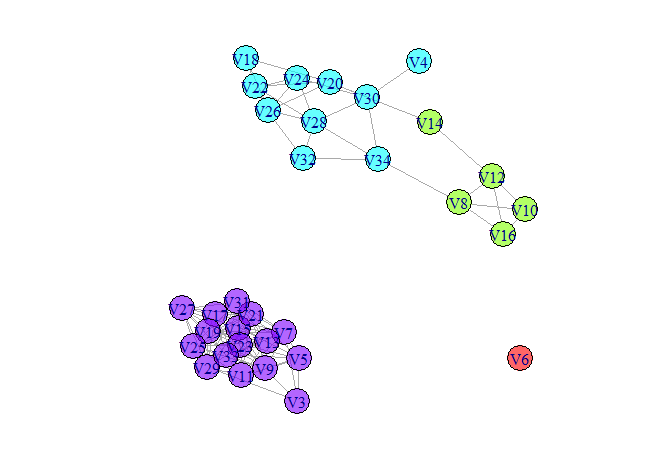 I'm aware there are multiple other queries about using igraph in R, but I have not found one which explicitly specifies the input format of the edges and nodes (from a correlation matrix) to get the louvain community detection working correctly. Thank you for any advice! I can provide further information if helpful. Since you say that your correlation matrix is 400x400, I expect that you will get that vcount gives 400 and ecount gives 79800 = 400 * 399 / 2. As you have constructed it, every node is directly connected to all other nodes. Of course there is only one big community. I suspect that what you are trying to do is group variables that are correlated. If the correlation is near zero, the variables should be unconnected. What seems less clear is what to do with variables with correlation near -1. Do you want them to be connected or not? We can do it either way. You do not provide any data, so I will illustrate with the Ionosphere data from the mlbench package. I will try to mimic your code pretty closely, but will change a few variable names. Also, for my purposes, it makes no sense to write the edges to a file and then read them back again, so I will just directly use the edges that are constructed. First, assuming that you want variables with correlation near -1 to be connected. Not a fully connected graph! Now let's find the communities. Not the answer you're looking for? Browse other questions tagged r cluster-analysis igraph or ask your own question.